Welcome, Ali, to the blog! Ali, how long did it take you from idea to publishing Become? Wow. This would take some serious math. I believe I had this idea in June of 2007. Gosh, it feels like I’ve been working on this story a lot longer than four years! Probably because while it’s only been a few years, it’s been through, oh, at least two dozen versions (not including revisions, but actual VERSIONS where different stuff happens). No joke. Hmm. Is this a trick question? How about I plot, (Save the Cat style), but I pants all the parts in between those plot points. Like an improv actor, I make up stuff at will—just so long as I hit my mark at all the right spots. Sounds good to me. What are you writing now or have forthcoming? I am busy, busy. I am currently querying a middle grade science fiction, drafting a middle grade fantasy and revising another middle grade fantasy. Book two in the Desolation series, DESOLATION (the sequel to BECOME) is currently resting between revisions. Wow! Good luck getting everything accomplished. I can't wait to read DESOLATION. I always find it interesting to learn what other authors are reading. If you could recommend a book—not your own—what book would that be? I always have a hard time recommending books, so I hope I don’t embarrass myself here! For middle grade readers/writers, my boys and I have really enjoyed THE LAST DRAGON CHRONICLES by Chris d’Lacey. 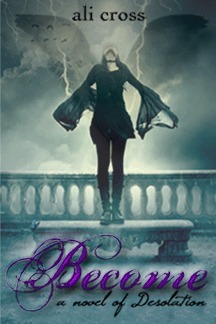 For young adult, I really loved POSSESSION by Elana Johnson because it was so different and EVERNEATH by Brodi Ashton because it was deliciously dark. The three books I’m most looking forward to reading right now (besides those books being released alongside mine!) are POSSESS by Gretchen McNeil, SKELETON LAKE by Angela Kulig and OPEN MINDS by Susan Quinn. Thanks so much for having me today Cherie! I appreciate you and your readers’ time! You're welcome! Great books to recommend and more books to add to my ever-growing to-be-read list. Ali is also "touring" with two other debut YA authors. They're calling themselves the Dark C.A.R.M.A. tour. (C for Christine Bryant, A for ali, R for RaShelle Workman). Here is a link to their trailer at http://www.youtube.com/watch?v=qsnv9QGSvmw and a link to their tour blog: http://darkcarmatour.blogspot.com. Congrats to Ali! :) The books sounds wonderful. I'm a pantser myself, who desperately would like to be a plotter. Maybe I can try doing bits of both? That might be a good compromise. Congrats, Ali. I'll need to read your book. Despite the fact that's the fiction genre I write, I have a hard time finding YA novels I like. Hi Jennifer! Hey, walk on the wild side with me and do both. I'd like the company! Diana, I hope you like BECOME. And I know what you mean regarding reading in your genre--my problem, I think, is that it's hard for me to just relax and read anymore because my brain wants to call it WORK and I find myself being pulled out of the story a lot asking myself questions about this technique or the other .... Just wish I could kick back and read for fun! Thanks again for hosting me today Cherie! I've been hearing great things about this book. I love the premise. This is a book I definitely want to read! I found it particularly interesting to read about plotting certain points and making things up in between, because this is pretty much what I do. I like some sort of structure, but it's fun to roll with sudden blasts of inspiration sometimes :).